Newtown. Live Music, amazing eateries and the hub of Sydney’s entertainment quarter. These sights and more are at your door step so what’s holding you back? If the answer is poor mobility then you need Sydney Wide Chiropractic who are committed to getting the best version of you, so you can enjoy the best Newtown has to offer. Chiropractic care permits your body to function the way it should. Modern life is fast paced and stressful and can have a negative impact on your posture and mobility. Your brain, spinal cord and the nerves that allow you the freedom of movement are the life and soul of your existence and here at Sydney Wide Chiropractic, the leading chiropractor in Newtown, we give you the care and support you need to take on your world in the best shape possible. It is our mission to give you the new lease on life that you have been waiting for. As the leaders in the industry for the past 11 years we understand how important your full functionality is and our services target outcomes that not only restore your vitality but improve your health life balance in ways that will make you wonder how you ever got by without us. The simple fact is that an imbalance in your spine does not only have an adverse effect on you, but also on your work life and your family. However, an accredited and specialist treatment, provided by the leading chiropractor in Newtown, can reverse the problems you may be facing with your body as well as stop bad habits before they even set in. So when it comes to your health why wouldn’t you choose the best? Get in touch with us today and start living the life you deserve, no other healthcare is more vital for your vitality and no other chiropractor in Newtown can offer the solutions, backed with success, which we can. Your health starts with you, but it succeeds with us. Call us now on (02) 9559 8877 and organise an appointment or email us at info@sydneychiropracticclinic.com.au. 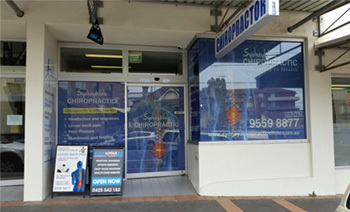 Sydney Wide Chiropractic, standing tall for you.